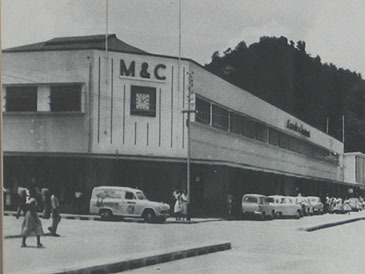 After two disastrous fires in 1948 and 1960 the present building was constructed following a merger between Minvielle & Chastanet Ltd. and Minvielle & Co. Ltd. and the trading name was M & C. The present building was also partially damaged by fire in 1973 and was refurbished and remodeled. The building was owned subsequently by Messrs Booker Ltd. of the U.K. still trading under the M & C name, as a result of a share buyout in the seventies. The building was sold to J.Q. Charles Ltd. who in turn sold it in 2003 to Blue Coral Ltd, a company owned solely by the National Insurance Corporation. This imposing building was erected by Minvielle & Chastenet after fire had destroyed their main premises in June 1960, the company's shareholders deciding to make a bold architectural statement whereby they demonstrated their confidence in the then fledging St. Lucian economy. 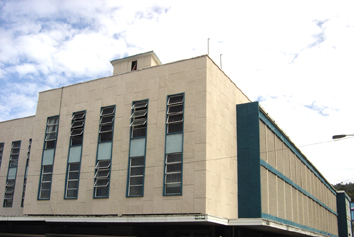 The building was designed by Arthur Dudley-Moore of the Trinidad firm of Mence & Moore, which company had first worked in St. Lucia during the rebuilding of Castries after the disastrous fire of 1948. The well-known local engineer "Teddy" Theobalds performed the engineering work and the contractor was Norman Walcott of Walcott Construction, Ltd.
Construction started in 1961 and the first phase following some 18 months later. With the exception of the architect all pro­fessional and labour input was local and this fact drew much praise from visitors both regional and international. The building broke new ground in St. Lucia in many respects some of which are listed hereunder. It was the first large all steel frame building to be erected in the city, and the size and strength of the foundations elicited much favourable comment. As the building was located on reclaimed land the use of large pumps to drain the water during construction was a constant requirement. It made full use of "Bris-Soleil" block techniques on the western frontage, these blocks being an effective anti-sun barrier which were in use in Trinidad at the time but which were relatively new St Lucia. They had initially been conceived for Mediterranean countries by the famous French architect Le Corbusier. Use was also made of hollow-pot clay blocks that were laid to support the floors before the cement was poured thereby creating floors of great strength. The steel frame from Trinidad was totally encased in cladding, this enabling the building to survive a major fire in 1972 which otherwise would have destroyed the integrity of the structure leading to the demolition of the building. It was the first building in Castries to feature both an escalator and an elevator. As a commercial building it also featured bold polished half-inch plate glass showcase windows that enabled superb win­dow displays to be designed. In peaceful years of old when the citizens of Castries walked and window shopped the city's streets at night, these displays were a source of great pleasure. Construction was aided by the extensive use of equipment that was relatively new to St Lucia at the time such as large concrete mixers, hoists, steel scaffolding, etc. This imposing building inevitably forms the centerpiece of downtown Castries and it is true to state that the future of the commercial heart of the city depends on the imaginative use to which the building will now be put. 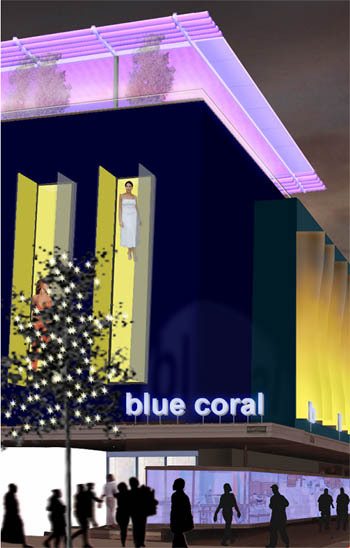 In 2003 Sean Compton won a design competition for remodeling the building, following are the concepts and the design which the Blue Coral Board is now considering. The remodeled building will be designed to create a shopping experience and a spot of spending leisure time. 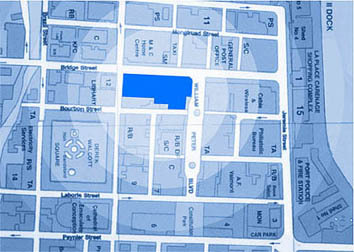 The layout of the stores within the building will differentiate it from the shopping mall format. Instead of cellular spaces connect ed by an internal street, the interior spaces are designed to flow within the ground volume of the building, creating a seamless shop ping experience - a destination. It is proposed that the external of the building be cladded with colour-coated aluminum rain-screen system. The northern facade, the fenestration will be designed to form "Vertical Display Strips" and provide light ventilation-wells into the store. On either side of these display-strips are full height vertical perforated anodized aluminum screens, set perpendicular to the facade forming brises-soleil shading the glass-bays from excess solar heat gain. At night the perforated screens glow with the illuminated "display strips" adding to the building is the louvered canopy of the pro posed new "Sky" garden restaurant, constructed out of the light-weight steel structure. The main entry to the building will be via the Boulevard a generous foyer houses the vertical circulation to the floor above, and the ground floor. The design proposes a creation of the three open vertical shafts forming atrial/lightwells and circulation spaces. The sidewalk will be expanded out into the street occupying the space now occupied by cars. The expanded sidewalk will incorpo rate semi-mature trees. The reclaimed areas will be rough-cobbled between the trees to discourage vending. The Blue Coral Building is set to be the hub of a rejuvenated Castries.